"Rockin' Robin" (Jackson 5) goes "Smells like teen spirit" (Nirvana) ... strange, and not completely harmonous... but very surprizing! what an unusual combination, the Jacksons & Nirvana. still I like both, and the combination kinda works! Okay, I'm an unabashed Nirvana devotee (I took up playing guitar at 15, specifically to learn to play their songs) , so obviously I'm interested in anything Nirvana or Cobain-related! 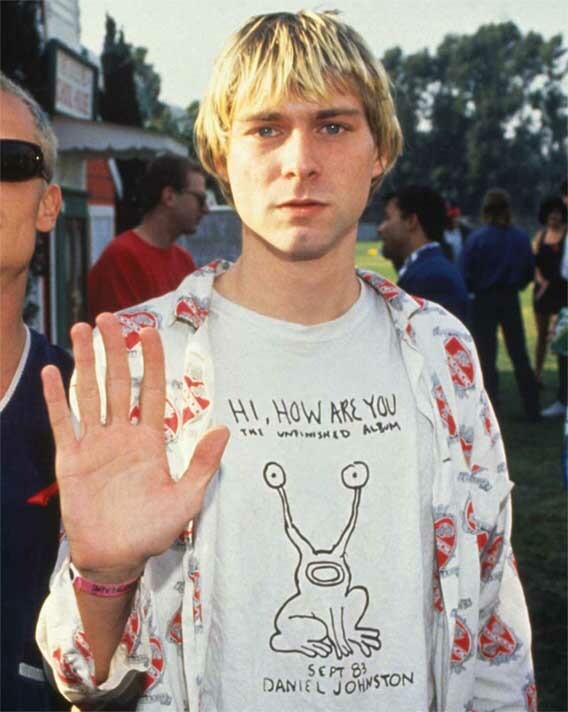 I've seen that photo of Kurt before, but I wonder if it's printed the correct way round each time because Kurt was left-handed.. In any case, the space ('quadrangle'?) between his head and heart lines is quite narrow, implying that he was the sort of person who did not readily share his feelings and thoughts with others. Accounts of his behaviour have confirmed this. Kurt's hands have always looked like typical air hands to me, and his long and knotted fingers (the Apollo and middle finger look particularly knotted to me) show a patient nature and attention to detail. His head line slopes ever so slightly, revealing an intellect blending realism and imagination. 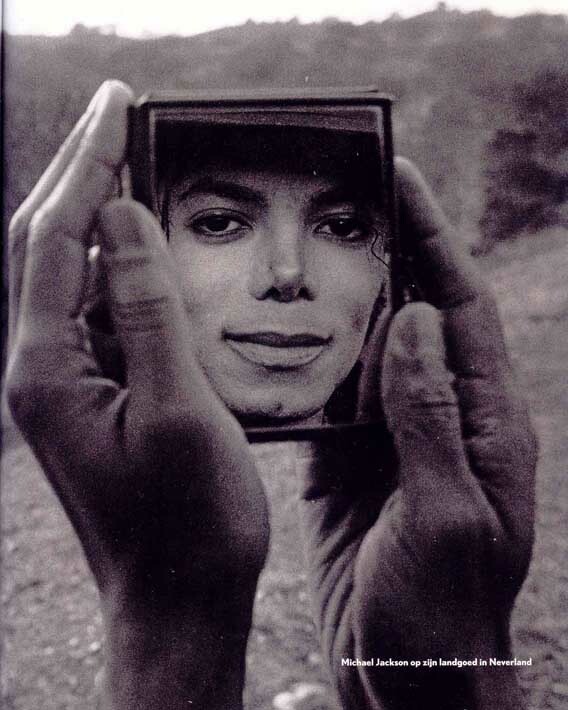 This photo in conjunction with other photos and footage I've seen of his hands, show that he had 'droplets'/'sensitivity pads'/'empathy pads' on his fingertips as well; he was sensitive to touch and had a strong artistic appreciation. His long, knotted fingers reveal that he had the potential skill to be a proficient artist (of any kind) himself. Oh, and I forgot to mention his angle of manual dexterity, the protruding angle located between the thumb and wrist. My God, it would be so unusual not to see this in successful musicians' hands! Jimi Hendrix possessed the same angle, and countless others of his professional ilk, too. Sparky10 wrote: I've seen that photo of Kurt before, but I wonder if it's printed the correct way round each time because Kurt was left-handed..
PS. Great to know that you are a Nirvana fan - I have a few other photos of Cobain's hands, so I'll try to present a nice tribute to his hands... sooner or later. Wave away my hypothesis. Right. Charming. The reason why I mentioned my belief that the photo was printed the wrong way round was because I don't think it's as important to read the passive hand as much as it is to read the dominant hand in an adult, so I was wondering why that particular photo was posted when Cobain's dominant hand was the left one. That's why. Cobain's left hand represented his realised potential, even though he could have realised a lot more of his potential if hadn't decided to blow his head off at 27 years-old. And don't get it.......why is Nirvana a pop band? Caprie wrote: And don't get it.......why is Nirvana a pop band? Edit: Okay, you're quite right: Nirvana was of course more a rock band. The bent middle and Index finger tell a lot. And also the powerful spatulate ring finger tip. I look forward to see a clearer version of Kurt's hand.